Beyond Fire! 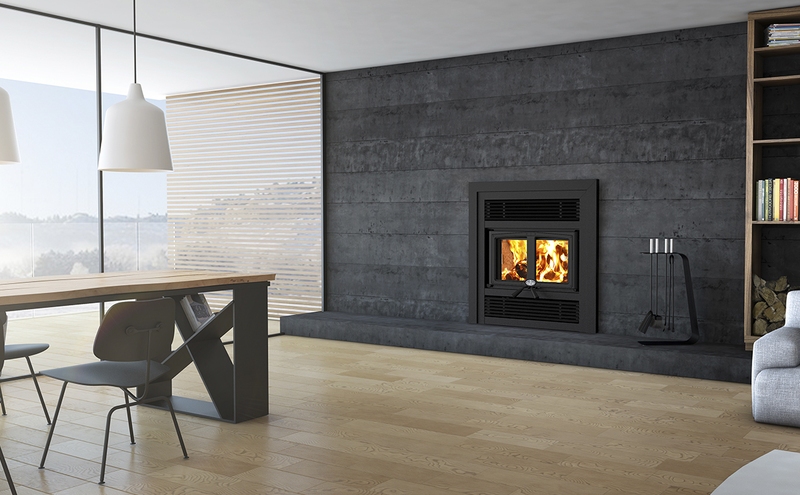 Give life to your living space with this wood-burning fireplace; its sleek modern lines blend with any décor. Heat. Make every evening a perfect one by remaining warm by the hearth. This fireplace heats an area of up to 2,200 square feet. Simplicity. The Everest easily integrates into the look of your room. Its façade has retractable double doors and is available in either a black or brushed nickel finish. Reliability. This high-quality wood fireplace is CSA B415.1-10 certified and carefully manufactured in Quebec. Enjoy the benefits of its reassuring presence during the long cold winter months. Glass surface – dimensions (Width X Height) 18 3/4" X 11 3/8"
Overall dimension (Height) 40 5/8"
Overall dimension (Width) 36 1/2"
Overall dimension (Depth) 26 1/8"
Door opening – dimension (Height) 10 7/8"
Door opening - dimension (Width) 20 3/4"
Firebox – dimension (Height) 16 7/8"
Firebox – dimension (Width) 18 7/8"
Firebox – dimension (Depth) 17"
Clearance – combustible side wall to unit 21" 21"
Clearance – top shelf to unit 48" 48"